Whether you’re on the lookout for last minute stocking fillers or you’ve yet to start your big shop, we’ve got you covered. Friday is the last day for guaranteed standard delivery before Christmas, so for 2 days only from 17th-18th December, we’re launching a site-wide* money saving spectacular! 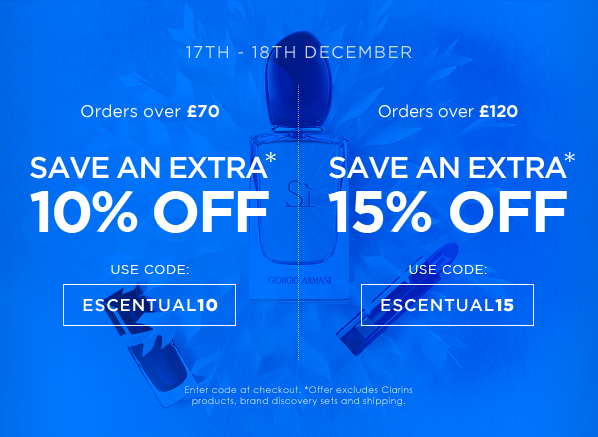 Save an extra 10% when you spend £70 with code ESCENTUAL10, and save a huge 15% when you spend £120 with code ESCENTUAL15. Shop their favourites in time for Christmas (and maybe treat yourself, too) – shop now! *Excludes Clarins, Try Before you Buy sample sets and shipping costs. See our Christmas gift guides for all budgets and personalities here, and take a look at our What’s New section here for all of the latest in fragrance, beauty and skincare. This entry was posted on Tuesday, December 17th, 2013 at 12:05 am and is filed under Bath & Shower, Fragrance, Haircare, Make-up, Men, Offers, Skincare, Sun and Tanning. You can follow any responses to this entry through the RSS 2.0 feed. You can skip to the end and leave a response. Pinging is currently not allowed.